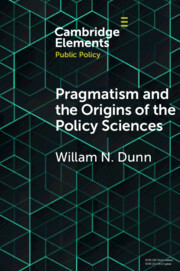 This Element presents an examination of the origins of the policy sciences in the School of Pragmatism at the University of Chicago in the period 1915–38. Harold D. Lasswell, the principal creator of the policy sciences, based much of his work on the perspectives of public policy of John Dewey and other pragmatists at Chicago. Characteristics of the policy sciences include orientations that are normative, policy-relevant, contextual, and multi-disciplinary. These orientations originate in pragmatist principles of the unity of knowledge and action and functionalist explanations of action by reference to values. These principles are central to the future development of the policy sciences. Ackoff, R. L. (1974a). Beyond Problem Solving. General Systems, 19, pp. 237–239. Ackoff, R. L. (1974b). Redesigning the Future: A Systems Approach to Societal Problems. New York, NY: John Wiley. Adelstein, R. (1992). Lindblom, Charles E.. Division II Faculty Publications. Paper 92. Available at: http://wesscholar.wesleyan.edu/div2facpubs/92. Adler, M. J. (1977). Philosopher at Large: An Intellectual Autobiography. Chicago, IL: University of Chicago Press. Almond, G. A. (1987). Harold Dwight Lasswell, 1902–1978: A Biographical Memoir. Washington, DC: National Academy Press. Almond, G. A. (2004). Who Lost the Chicago School of Political Science? Perspectives on Politics, 2(1), pp. 91–93. Anderson, J. A. (2011). Public Policymaking: An Introduction. Boston, MA: Wadsworth. Ansell, C. K. (2011). Pragmatist Democracy: Evolutionary Learning As Public Philosophy. New York, NY: Oxford University Press. Arnold, T. (1937). The Folklore of Capitalism. New Haven, CT: Yale University Press. Ascher, W. (1978). Forecasting: An Appraisal for Policy-Makers and Planners. Baltimore, MD: Johns Hopkins University Press. Ascher, W. and Hirschfelder-Ascher, B. (2004). Revitalizing Political Psychology: The Legacy of Harold D. Lasswell. Chicago, IL: Psychology Press. Atkins, W. E. and Lasswell, H. D. (1924). Labor Attitudes and Problems. Englewood Cliffs, NJ: Prentice-Hall. Auer, M. R. (2007). The Policy Sciences in Critical Perspective. In Rabin, J., Hildreth, W. B., Miller, G. J., and Rabin, J., eds., Handbook of Public Administration, 3rd edn. Boca Raton, FL: CRC Press, Taylor & Francis, pp. 541–562. Bimber, B. (1998). The Death of an Agency: OTA and Trophy Hunting in US Budget Policy. Policy Studies Review, 15(2–3), pp. 202–225. Bower, J. L. (1968). Descriptive Decision Theory from the “Administrative” Viewpoint. In Bauer, R. A. and Gergen, K. J., eds., The Study of Policy Formation. New York, NY: Free Press, chapter 3. Boyer, J. W. (2015). The University of Chicago: A History. Chicago, IL: University of Chicago Press. Braybrooke, D. and Lindblom, C. E. (1963). A Strategy of Decision: Policy Evaluation As a Social Process. New York, NY: Free Press of Glencoe. Brewer, G. D. and DeLeon, P. (1983). The Foundations of Policy Analysis. Homewood, IL: Dorsey Press. Bromley, D. W. (2006). Sufficient Reason: Volitional Pragmatism and the Meaning of Economic Institutions. Princeton, NJ: Princeton University Press. Bromley, D. W. (2008). Volitional Pragmatism. Ecological Economics, 68(1), pp. 1–13. Brown, S. R. (2002). Structural and Functional Information. Policy Sciences, 35(3), pp. 285–304. Brunner, R. D. (1991). The Policy Movement As a Policy Problem. Policy Sciences, 24(1), pp. 65–98. Brunner, R. D. (1997). Introduction to the Policy Sciences. Policy Sciences, 30(4), pp. 191–215. Bulmer, M. (1984). The Chicago School of Sociology: Institutionalization, Diversity, and the Rise of Sociological Research. Chicago, IL: University of Chicago Press. Burgess, E. W. (1916). The Social Survey: A Field for Constructive Service by Departments of Sociology. American Journal of Sociology, 21(3), pp. 492–500. Campbell, D. T. (1988). Epistemology and Methodology for Social Science: Collected Papers. Samuel Overman, E., ed., Chicago, IL: University of Chicago Press. Campbell, D.T. and Stanley, J. (1963). Experimental and Quasi-Experimental Designs for Research. Chicago, IL: Rand McNally. Carey, J. T. (1975). Sociology & Public Affairs: The Chicago School. Newbury Park, CA: Sage Publications. Churchman, C. W. (1967). Guest Editorial: Wicked Problems. Management Science 14(4), pp. B141–B142. Colebatch, H. K. (2002). Policy, 2nd edn. Buckingham: Open University Press. Collingwood, R. G. (1940). An Essay on Metaphysics. Oxford: Clarendon Press. Cook, T. D. and Campbell, D. T. (1979). Quasi-Experimentation: Design and Analysis Issues for Field Settings. Boston, MA: Houghton Mifflin. Corbacıoğlu, S. (2008). Invisible University in Public Policy Analysis: Cognitive and Social Networks among Six Social Scientists. Review of Public Administration, 2(4), pp. 27–54. Couch, M. B. (2011). Causal Role Theories of Functional Explanation. In Fieser, J. and Dowden, B., eds., Internet Encyclopedia of Philosophy: A Peer Reviewed Academic Resource. Available at: https://philpapers.org/rec/COUCRT [Accessed June 28, 2016]. Coughlin, N. (1973). Young John Dewey: An Essay in American Intellectual History. Chicago, IL: University of Chicago Press. Crick, B. (1959). The American Science of Politics: Its Origins and Conditions. Berkeley, CA: University of California Press. DeLeon, P. (1988). Advice and Consent: The Development of the Policy Sciences. New York, NY: Russell Sage Foundation. DeLeon, P. (1992). The Democratization of the Policy Sciences. Public Administration Review, 52(2), pp. 125–129. DeLeon, P. (1994). Reinventing the Policy Sciences: Three Steps Back to the Future. Policy Sciences, 27(1), pp. 77–95. DeLeon, P. (1999). The Stages Approach to the Policy Process: What Has It Done? Where Is It Going? In Sabatier, P. A., ed., Theories of the Policy Process. Boulder, CO: Westview Press, pp. 19–32. DeLeon, P. (2006). The Historical Roots of the Field. In Moran, M., Rein, M., and Dery, R. E., eds., Problem Definition in Policy Analysis. Lawrence, KS: University Press of Kansas. Deutsch, K., Platt, J., and Senghaas, (1970). Major Advances in Social Science since 1900: An Analysis of Conditions and Effects of Creativity. Washington, DC: American Association for the Advancement of Science. Deutsch, K., Markovits, A., and Platt, J., eds. (1986). Advances in the Social Sciences, 1900–1986. Lanham, MD: University Press of America. Dewey, J. (1896). The Reflex Arc Concept in Psychology. The Psychological Review 3(4), pp. 357–370. Dewey, J., (1922). Human Nature and Conduct. Southern Illinois University Press. Dewey, J. (1933/1991). How We Think. Amherst, MA: Prometheus. Dewey, J. (1938/1982). Logic: The Theory of Inquiry. New York, NY: Irvington. Dewey, J. and Bentley, A. (1949). Knowing and the Known. Boston, MA: Beacon Press. Diesing, P. (1992). How Does Social Science Work? Reflections on Practice. Pittsburgh, PA: University of Pittsburgh Press. Dunn, W. N. (1988). Forethoughts: The Disputed Paternity of Technological Innovation. Knowledge in Society, 1(2), pp. 3–6. Dunn, W. N. (2018). Public Policy Analysis, 6th edn. New York, NY: Routledge. Dzuback, M. A. (1991). Robert M. Hutchins: Portrait of an Educator. Chicago, IL: University of Chicago Press. Easton, D. (1950). Harold Lasswell: Policy Scientist for a Democratic Society. Journal of Politics, 12(3), pp. 450–477. Eulau, H. and Zlomke, S. (1999). Harold Lasswell’s Legacy to Mainstream Political Science: A Neglected Agenda. American Review of Political Science, 2, pp. 75–89. Falk, R. A., Higgins, R., Reisman, W., and Weston, B. (1998). Myres Smith McDougal (1906–1998). American Journal of International Law, 92(4), pp. 729–733. Farr, J., Hacker, J. S., and Kazee, N. (2006). The Policy Scientist of Democracy: The Discipline of Harold D. Lasswell. American Political Science Review, 100(4), pp. 579–587. Fayol, H. (1916/1949). General and Industrial Management. London: Pitman. Fischer, F. and Miller, G.J. eds., (2006). Handbook of Public Policy Analysis: Theory, Politics, and Methods. CRC Press. Garrison, J. (2009). Dewey’s Constructivism: From the Reflex Arc Concept to Social Constructivism. In Hickman, L. , S. Neubert and K. Reich eds., John Dewey: Between Pragmatism and Constructivism. New York, NY: Fordham University Press, pp. 84–105. Gerring, J. (2010). Causal Mechanisms: Yes, But …. Comparative Political Studies, 43(11), pp. 1499–1526. Goodspeed, T. W. (1916). A History of the University of Chicago. Chicago, IL: University of Chicago Press. Gulick, L. and Urwick, L., eds. (1937). Papers on the Science of Administration. New York, NY: Institute of Public Administration. Hausman, D. M. (1992). The Inexact and Separate Science of Economics. New York, NY: Cambridge University Press. Hayek, F. (1945). The Use of Knowledge in Society.” American Economic Review, 35(4), pp. 519–530. Hempel, C. G. (1959). The Logic of Functional Analysis. In Gross, L., ed., Symposium on Sociological Theory. Evanston, IL: Harper and Row. Hempel, C. G. (1965). Aspects of Scientific Explanation. New York, NY: Free Press. Hickman, L., Neubert, S. and Reich, K. eds. (2009). John Dewey: Between Pragmatism and Constructivism. New York, NY: Fordham University Press. Hoppe, R. (1999). Policy Analysis, Science and Politics: From “Speaking Truth to Power” to “Making Sense Together.” Science and Public Policy, 26(3), pp. 201–210. Imbens, G. and Rubin, D. (2015). Causal Inference for Statistics, Social, and Biomedical Sciences: An Introduction. Cambridge: Cambridge University Press. James, W. (1890/1950). The Principles of Psychology. Mineola, NY: Dover Press. James, W. (1907). Pragmatism, a New Name for Some Old Ways of Thinking: Popular Lectures on Philosophy. New York, NY: Longman, Green, and Company. James, W. (1909/1995). Pragmatism. Mineola, NY: Dover Press. Jann, W. and Wegrich, K. (2007). Theories of the Policy Cycle. In Fischer, F. and G. J. Miller, eds., Handbook of Public Policy Analysis. New York, NY: Routledge, pp. 69–88. Jenkins-Smith, H. C. and Sabatier, P. A. (1993). The Study of the Public Policy Process. In Sabatier, P. A. and Jenkins-Smith, H. C., eds., Policy Change and Learning: An Advocacy Coalition Approach. Boulder, CO: Westview Press, pp. 1–19. Jones, C. O. (1977). An Introduction to the Study of Public Policy, 2nd edn. North Scituate, MA: Duxbury Press. Kagel, A. and Roth, A. (1995). Handbook of Experimental Economics. Princeton, NJ: Princeton University Press. Kaplan, A. (1964). The Conduct of Inquiry: Methodology for Behavioral Science. San Francisco, CA: Chandler Publishing Company. Karl, B. D. (1975). Charles E. Merriam and the Study of Politics. Chicago, IL: University of Chicago Press. Lasswell, H. D. (1936). Politics: Who Gets What, When, How. New York, NY: P. Smith. Lasswell, H. D. (1938). Propaganda Technique in the World War. New York, NY: P. Smith. Lasswell, H. D. (1941). The Garrison State. American Journal of Sociology, 46(4), pp. 455–468. Lasswell, H. D. (1943). Personal Policy Objectives. Memorandum, October 1. Lasswell, H. D. (1948). The Structure and Function of Communication in Society. In Bryson, L., ed., The Communication of Ideas. New York, NY: Institute for Religious and Social Studies, pp. 215–228. Lasswell, H. D. (1951). The Policy Orientation. In Lerner, D. and Lasswell, H. D., eds., The Policy Sciences: Recent Developments in Scope and Method. Palo Alto, CA: Stanford University Press, pp. 3–15. Lasswell, H. D. (1956a). The Decision Process: Seven Categories of Functional Analysis. Lanham, MD: Bureau of Governmental Research, College of Business and Public Administration, University of Maryland. Lasswell, H. D. (1956b). The Political Science of Science: An Inquiry into the Possible Reconciliation of Mastery and Freedom. American Political Science Review, 50(4), pp. 961–979. Lasswell, H. D. (1960). Technique of Decision Seminars. Midwest Journal of Political Science, 4(3), pp. 213–236. Lasswell, H. D. (1965). World Politics and Personal Insecurity. New York, NY: Free Press. Lasswell, H. D. (1971a). The Cross-Disciplinary Manifold: The Chicago Prototype. In Lepawsky, A. and Buehrig, E., eds., Search for World Order. New York, NY: Appleton-Century Crofts, pp. 417–428. Lasswell, H. D. (1971b). A Pre-View of Policy Sciences. New York, NY: American Elsevier. Lasswell, H. D. and Kaplan, A. (1950). Power and Society: A Framework for Political Inquiry. New Haven, CT: Yale University Press. Lasswell, H. D. and Leites, N. C. (1965). Language of Politics: Studies in Quantitative Semantics. Boston, MA: MIT Press. Lasswell, H. D. and McDougal, M. S. (1943). Legal Education and Public Policy: Professional Training in the Public Interest. Yale Law Journal, 52(2), pp. 203–295. Lasswell, H. D. and McDougal, M. S. (1992). Jurisprudence for a Free Society: Studies in Law, Science, and Policy. 2 vols. New Haven, CT: New Haven Press/Martinus Nijhoff Publishers. Lerner, D., ed. (1959). The Human Meaning of the Social Sciences. New York, NY: World Publishing Company. Lerner, D. and Lasswell, H. D., eds. (1951). The Policy Sciences. Palo Alto, CA: Stanford University Press. Levison, A. (1966). Knowledge and Society. Inquiry, 9(1–4), pp. 132–146. Lindblom, C. E. (1965). The Intelligence of Democracy: Decision Making through Mutual Adjustment. New York, NY: Free Press. Lindblom, C. E. (1991). Inquiry and Change. New Haven, CT: Yale University Press. Lindblom, C. E. and Cohen, D. K. (1979). Usable Knowledge: Social Science and Social Problem Solving. New Haven, CT: Yale University Press. Lynd, R. S. (1939). Knowledge for What? The Place of Social Science in American Culture. Princeton, NJ: Princeton University Press. Marshall, A., (1890). Principles of Economics. London, Macmillan. May, J. V. and Wildavsky, A., eds. (1979). The Policy Cycle. Beverley Hills, CA: Sage Publications. McDougal, M. S., Lasswell, H. D., and Reisman, W. M. (1967). The World Constitutive Process of Authoritative Decision. Journal of Legal Education, 19(3), pp. 253–230. McDougal, M. S., Lasswell, H. D., and Reisman, W. M. (1972). The Intelligence Function and World Public Order. Temple Law Quarterly, 46, p. 365. Menand, L., ed. (1997). Pragmatism: A Reader. New York, NY: Vintage. Menand., L. (2001). The Metaphysical Club. New York, NY: Farrar, Straus, and Giroux. Mitroff, I. I. (1974). The Subjective Side of Science: A Philosophical Inquiry into the Psychology of the Apollo Moon Scientists. Amsterdam: Elsevier Scientific. Moore, A. W. (1910). Pragmatism and Its Critics. Chicago, IL: University of Chicago Press. Nagel, E. (1968). The Structure of Science: Problems in the Logic of Scientific Explanation. New York, NY: Routledge and Kegan Paul. Nakamura, R. T. (1987). The Textbook Policy Process and Implementation Research. Review of Policy Research, 7(1), 142–154. National Academy of Sciences (2009). The Use of Scientific Evidence in Public Policy. Washington, DC: National Academies Press. Parsons, T. (1949). The Structure of Social Action. New York, NY: Free Press. Peirce, C. S. (1877). The Fixation of Belief. Popular Science Monthly, 12 (November). Peters, B. G. and Pierre, J. (2016). Comparative Governance: Rediscovering the Functional Dimension of Governing. Cambridge: Cambridge University Press. Peters, J. D. and Simonson, P. (2004). Mass Communication and American Social Thought: Key Texts, 1919–1968. New York, NY: Addison-Wesley. Polsby, N. W., Dentler, R. A., and Smith, P. A. (1963). Politics and Social Life: An Introduction to Political Behavior. Boston, MA: Houghton Mifflin. Quade, E. S. (1989). Analysis for Public Decisions. 3rd rev. edn., Carter, G. M., ed. New York, NY: North Holland. Raiffa, H., (1968). Decision Analysis. Reading, MA: Addison-Wesley. Rein, M. and White, S. (1977). Policy research: Belief and doubt. Policy Analysis, 4(3), pp. 239–271. Reisman, W. M. (1998). Theory about Law: Jurisprudence for a Free Society. Yale Law Journal, 108, pp. 935–937. Rescher, N. (1977). Methodological Pragmatism. Oxford: Basil Blackwell. Rescher, N. (1980). Induction: An Essay on the Justification of Inductive Reasoning. Pittsburgh, PA: University of Pittsburgh Press. Rescher, N. (1995). Pragmatism. In Honderich, T., ed. The Oxford Companion to Philosophy. Oxford and New York, NY: Oxford University Press, pp. 710–714. Rice, S. and Lasswell, H. D., eds. (1931). Methods in the Social Sciences: A Case Book. Chicago, IL: University of Chicago Press. Rorty, R. (1999). Truth without Correspondence to Reality. In R. Rorty, Philosophy and Social Hope. Baltimore, MD: Penguin Books, pp. 23–46. Rucker, D. (1969). The Chicago Pragmatists: Dewey, Ames, Angell, Mead, Tufts, Moore. Minneapolis, MN: University of Minnesota Press. Sabatier, P. A. (1987). Knowledge, Policy-Oriented Learning, and Policy Change: An Advocacy Coalition Framework. Science Communication, 8(4), pp. 649–692. Sabatier, P. A. (1988). An Advocacy Coalition Framework of Policy Change and the Role of Policy-Oriented Learning Therein. Policy Sciences, 21(2–3), pp. 129–168. Sabatier, P. A. (1991). Toward Better Theories of the Policy Process. PS: Political Science and Politics 24(June), pp. 147–156. Sabatier, P. A. ed. (1999, 2006). Theories of the Policy Process. 1st and 2nd edn. Boulder, CO: Westview Press. Sabatier, P. A. and Weible, C., eds. (2014). Theories of the Policy Process. 3rd edn. Boulder, CO: Westview Press. Salmon, W. C. (1984). Scientific Explanation and the Causal Structure of the World. Princeton, NJ: Princeton University Press. Schickore, J. and Steinle, F., eds. (2006). Revisiting Discovery and Justification: Historical and Philosophical Perspectives on the Context Distinction, Vol. 14. New York, NY: Springer Science & Business Media. Shadish, W., Cook, T. D., and Campbell, D. T. (2002). Experimental and Quasi-Experimental Designs for Generalized Causal Inference. Chicago, IL: Houghton Mifflin. Shields, P. (2004). Classical Pragmatism: Engaging Practitioner Experience. Administration & Society, 36(3), pp. 351–361. Shook, J. R. and Backe, A. (2001). The Chicago School of Functionalism. 3 vols. Bristol, UK: Thoemmes Press. Simon, H. A. (1944). Decision-Making and Administrative Organization. Public Administration Review, 4(1), pp. 16–30. Simon, H. A. (1947). Administrative Behavior: A Study of Decision Making Processes in Administrative Organizations. New York, NY: Macmillan. Simon, H. A. (1973).The Structure of Ill Structured Problems. Artificial Intelligence, 4(3–4), pp. 181–201. Storr, R. J. (1966). A History of the University of Chicago: Harper’s University – The Beginnings. Chicago, IL: University of Chicago Press. Tomas, V., ed. (1957). Charles S. Peirce: Essays in the Philosophy of Science. Edited with an introduction by Vincent Tomas. New York, NY: Liberal Arts Press. Torgerson, D. (1985). Contextual Orientation in Policy Analysis: The Contribution of Harold D. Lasswell. Policy Sciences, 18(3), pp. 241–261. Tribe, L. H. (1972). Policy Science: Analysis or Ideology? Philosophy and Public Affairs, 2(Fall), pp. 66–110. Van Doren, J. and Roederer, C. J. (2012). McDougal-Lasswell Policy Science: Death and Transfiguration. Richmond Journal of Global Law and Business, 11(2), pp. 125–157. Wagner, P., Weiss, C. H., Wittrock, B., and Wollman, H. (1994/2008). Social Science and Modern States. Cambridge: Cambridge University Press. Webb, E. J., Campbell, D. T., Schwartz, R. D., and Sechrest, L. (1966). Unobtrusive Measures: Nonreactive Research in the Social Sciences (Vol. 111). Chicago, IL: Rand McNally. Webber, M. M. and Rittel, H. W. (1974). Dilemmas in a General Theory of Planning. Policy Sciences, 4(2), pp. 155–169. Weimer, D. and Vining, A. (2015). Policy Analysis: Concepts and Practice, 5th edn. New York, NY: Routledge. Yale Law School Legal Scholarship Repository (1973). “Myres S. McDougal.” New Haven, CT. Element abstract views reflect the number of visits to the element page.